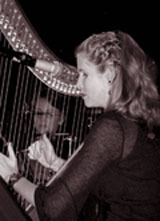 Jennifer (harp, vocals, bass guitar, psaltery) is a full-time professional musician. She plays harp professionally, teaches harp and voice lessons, and is serving as Director of Music for Southport United Methodist Church. She holds B.A. and M.M. degrees in music. Joy and relief make themselves felt.